Have a Kriega US 20 bought from Sportsbike shop,it's excellent,always dry gear even in a lash down.So bought a US 10 to add to the capacity.Fix to the bike really well,put them on and never need to check them,always secure.Top product. Another quality addition to my Kreiga collection. If soft luggage is for you, definitely look at this stuff. Good service as usual from the Sportsbike gang and kept informed all the time. 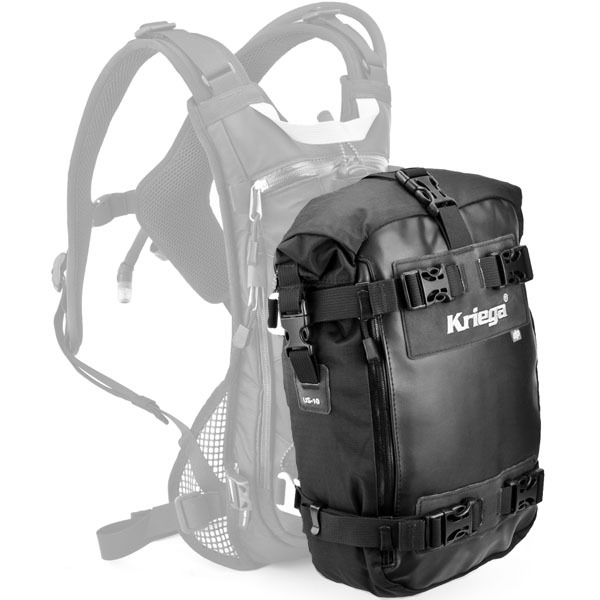 Kriega quality item which you can't go wrong with. I bought this to take on the bike for days out. It's not very big but ideal for a few bits or to combine with other packs to create a luggage system. 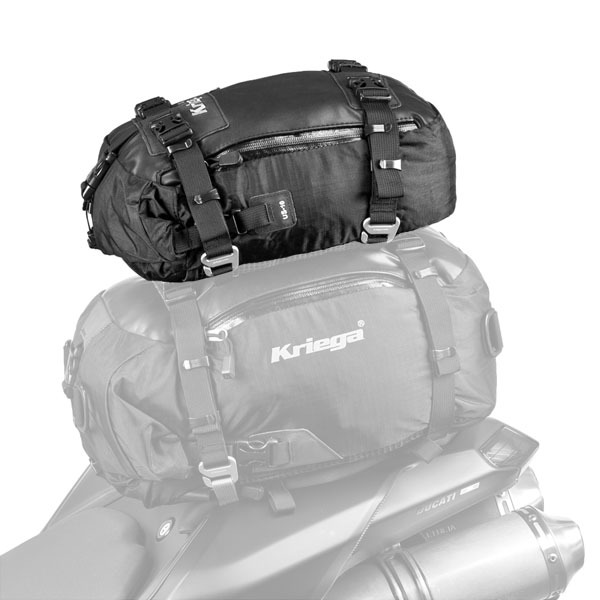 Used Kriega bags before so I know they are great quality and truly waterproof luggage. I'd been strapping a large bag to the pillion seat which was scratching my paintwork and after lots of research I decided on the Kriega 10. It fits everything in it for my needs at work - food, drinks, phone and wallet etc. It's the perfect size for day to day useage but I will be ordering a 20 for long weekends away. The bag straps tightly to my bike and looks the part to as I'm not one for attaching a top box on a sportsbike. I can't honestly comment about the waterproofing yet as it's been one of the best summers here and I've seen no rain! Brilliant service from Sportsbikeshop too. Very well made with good fasteners. Should be waterproof and hard wearing. Takes up very little space but big enough for day trips. Decent, high quality as you would expect. Modularity comes in handy and I immediately nought the 20L after this arrived. A bit fiddly to install the loops. Perhaps this is due to the bike I am using. But after they are in there's no need to mess around again as they all use the same fitting. It's easy to fit to the bike as the instructions are nice and clear. I have got a pair of shoes and a change of top in the bag with a bit of space to spare, so just the right size for me. 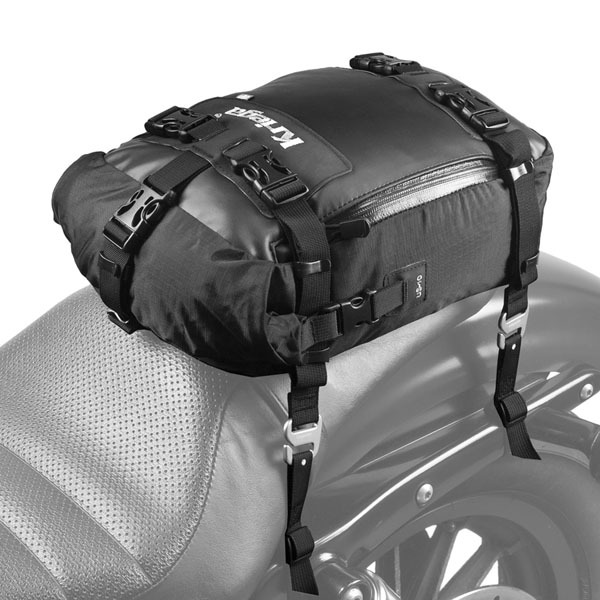 Fits on the rear rack of CRF1000 using the supplied loop straps, totally waterproof and the white waterproof inside lining makes it easy to find stuff. Well made bag with good quality fittings and stitching. Not cheap but should last a long time. Would consider buying a larger one for more than day out touring. I just love this bag. Excellent service. 100% waterproof tailpack which also fits to Hydro 3, R15, R20, R25, R30 and R35, increasing capacity by 10 litres. The US-10 tailpack is designed to fit most race-rep style seat pads. The pack is easily attached / removed by four quick-release alloy hooks. No extra bungees or covers are needed. The US-10 can also be used as a tankbag with the optional tank product. The base of the US-10 tailpack has an anti-slip coated-mesh pocket for storage of D-locks / chains etc. Fitting - All US-packs fit with alloy hooks and have never been easier or quicker to take on and off, with no loose straps left on the bike. The ultra secure subframe fitting allows tailpack combinations of up to 90-litres and is particularly suitable for bolt-on seat pads and traditional one-piece seats (4 x web loops attach to the subframe and exit at the seat edge) Attach the 4 x alloy hooks to the loops and compress the pack down with the Q/R adjusters. Secure the loose strap ends with the web tidy components and you're ready to go. NB - US-packs can be mounted inline or across the seat. 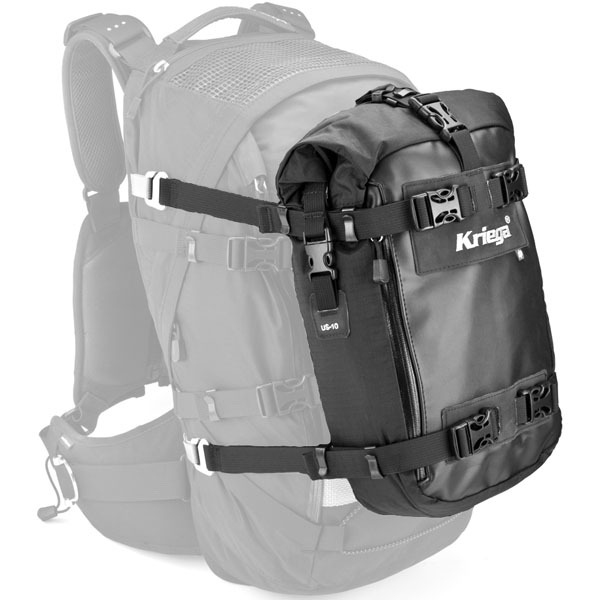 The US-10 can also attach to Kriega rucksacks and TANK with either the old style fitting straps or with the new alloy hooks. Tank - The tank converter kit allows the US-10 to be used as a 100% waterproof tankbag. US-10s have 4 x alloy hook straps as standard (Kriega recommends pre-2012 users to upgrade to the new hooks: these fit very easily and quickly to the web ladder loops on the tank product. To take off, use the 4 x quick-release buckles to release the pack and the grip base away from the straps. Hydro-3 - Retro-fit the US-10 to the Hydro-3 hydration pack to increase carrying capacity by 10-litres. Fit to the backpack with the alloy hooks to the 4 x web loops on the front panel. Finally thread the top US-10 roll-over strap through the top horizontal web loop on the Hydro-3. Compress the US-10 pack down with all of the Q/R adjusters and use the web tidy components. 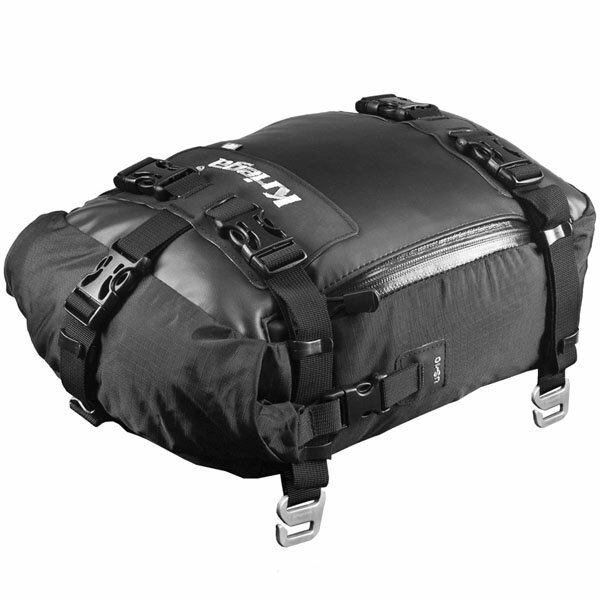 R15 - Retro-fit the US-10 to the R15 backpack to increase carrying capacity by 10-litres. Fit to the backpack with the alloy hooks to the 4 x web loops on the front panel. Finally thread the top US-10 roll-over strap through the top horizontal web loop on the R15. Compress the US-10 pack down with all the Q/R adjusters and use the web tidy components. R20 - Retro-fit the US-10 to the R20 backpack to increase carrying capacity by 10-litres. Fit to the backpack with the alloy hooks to the 4 x web loops on the front panel. Finally thread the top US-10 roll-over strap through the top horizontal web loop on the R20. Compress the US-10 pack down with all the Q/R adjusters and use the web tidy components. R25 - Retro-fit the US-10 to the R25 backpack to increase carrying capacity by 10-litres. Pack out the R25 and tighten the compression straps down. Attach to the backpack with the alloy hooks to either the top 4 x web loops on the backpack compression buckles or to the 4 x specific web loops on the side compression straps. Which ever is the most stable. Compress the US-10 pack down and use the web-tidy components. R30 - Retro-fit the US-10 to the R30 backpack to increase carrying capacity by 10-litres. Pack out the R30 and tighten the compression straps down. Attach to the backpack with the alloy hooks to either the top 4 x web loops on the backpack compression buckles or to the 4 x specific web loops on the side compression straps. Which ever is the most stable . Compress the US-10 pack down and use the web-tidy components. R35 - Retro-fit the US-10 to the R35 backpack to increase carrying capacity by 10-litres. Pack out the R35 and tighten the compression straps down. Attach to the backpack with the alloy hooks to either the top 4 x web loops on the backpack compression buckles or to the 4 x specific web loops on the side compression straps. Which ever is the most stable. Compress the US-10 pack down and use the web-tidy components. 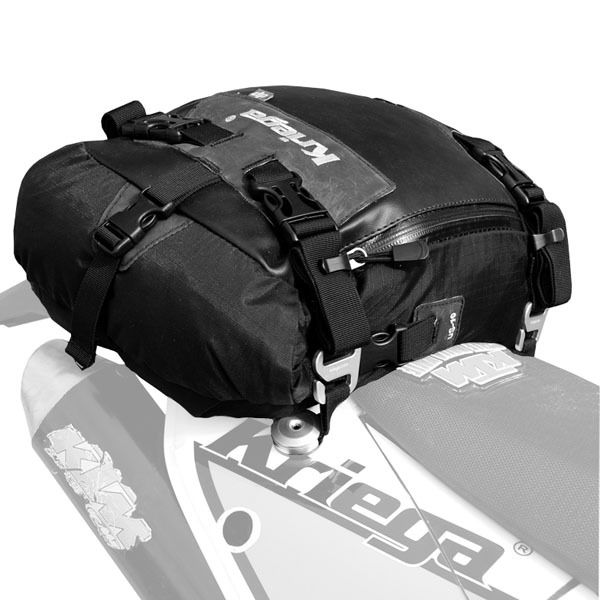 Dirtbike - The US-10 can be fitted to a dirtbike rear fender by using Kriega's Rack loop product. 4 x alloy fasteners with web loops allow US-packs to be hooked on, across or inline with the bike. Hi, would this fit a Honda pcx ? The Kreiga US-10 is a universal product, and so we are not able to advise on specific bike fitment. However, we can see no reason why this should not fit your Honda. On the US-10 what's the distance between the straps? The distance between the straps is 16cm.